For many families, the pool is the real heart of their home. To get the most out of your pool, you want to be able to enjoy it both in the daytime and at night. This is where lighting comes in. There are two main kinds of pool lights: aboveground lights and those installed under the water. These lights do two main things: they can give the pool an attractive, diffused glow, and they also let you go swimming at night. You can choose light fixtures that stand out or those that blend seamlessly into the pool walls. Underwater pool lights are also a great way to use bright or vivid colors to tint the water. There are hundreds of varieties of above ground lights to choose from. Options include softer lights which create a relaxed atmosphere, or bright and vivid lights that better illuminate the space around the pool area. You can also mix the two, allowing for both spots for relaxation as well as the ability to see the pool edge well so people can stay safe. Above ground lights can be found in a wide variety of attractive, weatherproof housings, or disguised around the pool in other features. They can also be mounted high up on trees, gazebos, or the outside walls of the house. 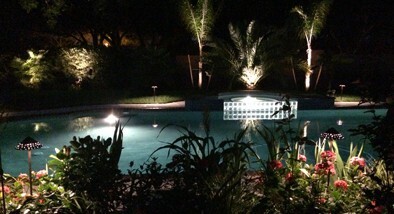 Pool lights are necessary if you want your guests and family to stay safe at night or on cloudy days. You can aim bright lights at pool features such as the ladder going in, the diving board, steps into the water, the edge of the pool, and the pool deck. It’s also a good idea to use lights to mark out the path back to the house. Your lighting designer will be able to help you here, but spend some time thinking about the focal points and best features in your yard. Does your pool have a waterfall or other water feature? Do you have a pergola or gazebo nearby? What about beautiful raised beds or a hot tub? The right lighting can draw guests there at night, opening these spaces up and creating different aesthetics for the area. You can direct colored lights at your waterfall or fountain to add a splash of drama. You can also have several stages of lighting that can be turned on and off, letting you control how bright the pool area gets. This is great if you have a party or special event but usually want a more relaxed and intimate atmosphere. If you have a gorgeously designed flowerbed nearby, flaunt it. The right landscape lighting setup can add magic and beauty to your nighttime yard. Do you have a dramatic pergola, gazebo, or arbor near your pool? Turn this into a hangout hotspot by lighting it with twinkly fairy lights or more sophisticated diffused ambient lighting. This will give swimmers a welcoming space for when they climb out of the water to dry off. It also creates a great place to put the buffet table if you’re having a party. 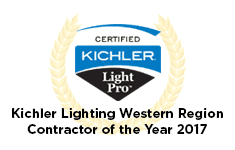 Enhanced Outdoor Lighting & Design has years of experience brightening up the pools of homes in the San Antonio and Austin region. They will work with you on a final design and create a lighting plan that will flow beautifully with your outdoor space. Visit their website or call them today to schedule a consultation.